This design was inspired by my love of geometry and as a tribute to so many of the beautiful crochet works of the 60s and 70s. The pattern includes instructions both for a sweater and a dress. Worked from the top down, both items are worked the same to the waist so you can always decide which one to make as you go! The pattern is worked using DK yarn and a 4mm hook. The item pictured uses Rico Cotton soft DK (aff) in 50g balls, but most DK yarns which meet gauge can be used. Depending on you chosen size, you will need 8-13 balls (400 – 650g / 890 – 1580m) for the sweater and 11 – 19 balls (550 – 950g / 1350 – 2300m) for the dress. This pattern would suit intermediate crocheters, or confident beginners. Simple stitches and a 4 row pattern repeat is are used throughout. Decreasing and increasing is required for the sleeves and dress respectively. Foundation chains are used to start the garment (instructions and modifications are given). Both pattern are written for sizes XS-3X. Approximate finished measurements, including a schematic, and gauge information are given within the pattern. It is simple to adjust the length of the sleeves, sweater or dress. The pattern is written using US crochet terms. I hope you enjoy the pattern and, as always don’t forget to tag me on Instagram @doraexplored, or use #tributesweater / #tributedress or #hookmehappy. I’d love to see and share your efforts! Perfect for newer crocheters looking to make their first garment, this is the first release in association with the My Crochet Wardrobe Facebook group (open to anyone to join!). This group is aimed at demystifying the crochet garment making process. This is the perfect jumper for a winter afternoon walk or just to get cosy on the sofa with your favourite book! This is easy level with simple shaping and minimal seaming. The pattern uses simple stitches and easy decreases. The neck, cuffs and hem are worked in the back loop only. 8mm Hook750-1400m / 6-10 balls of We are Knitters The Petite Wool (affiliate) (depending on your chosen size) or equivalent chunky yarn which meets gauge. 750-1400m / 6-10 balls of We are Knitters The Petite Wool (affiliate) (depending on your chosen size) or equivalent chunky yarn which meets gauge. The pattern is written is sizes XS, S, M, L, 1X, 2X, 3X with a breakdown of bust and length measurements and a schematic given in the pattern to assist your size choice. I hope you enjoy the pattern and, as always don’t forget to tag me on Instagram @doraexplored, or use #hookmehappy. I’d love to see and share your efforts! (C) DoraDoes 2018. You may sell what you make from my patterns, but please credit me as the designer at doradoes.co.uk. The pattern is for personal use only and may not be shared. My photos may be shared with credit. This lovely cosy winter sweater is perfect to pair with skinny jeans, long skirts or over the top of a jumpsuit when you need something extra! The sweater combines a wide cropped body with closer fitting sleeves, so it will still fit under your coat, and a cosy roll neck to keep the wind at bay. The pattern uses chunky yarn to create two columns of twisted cables which will keep you on the straight and narrow! This is a relatively quick project and a great introduction to working with cables (post stitches). Download the pattern now from Ravelry, Love Crochet or Etsy. This is easy to intermediate level with simple seaming. It uses the extended single crochet stitch (which is simple to pick up and explained in full in the pattern) and front and back post stitches to create the cables. The neck, cuffs and hem are worked in the back loop only. 8mm Hook, or size required to meet gauge. 650-1050m (5-8 balls) of We are Knitters The Petite Wool(aff) (depending on your chosen size) or equivalent chunky yarn which meets gauge. This pattern would work with other chunky yarns which meet gauge. This Pattern is available to download from the usual platforms: Ravelry, Love Crochet or Etsy. You may sell what you make from this pattern but the pattern is for personal use only and may not be shared or reproduced without prior written consent. Photos may be shared with credit. Everyone loves an underdog right? 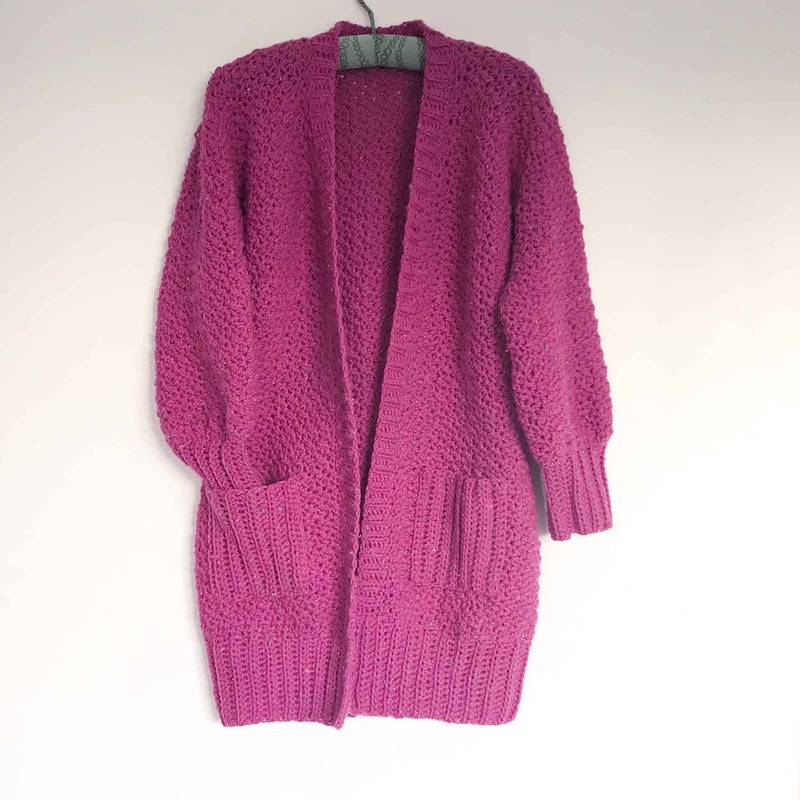 This cardigan uses a simple timeless stitch pattern then throws in some extra personality with it’s bulb sleeves and phone-sized pockets – yes – it has pockets! This is one of those cardis which, just like the underdog, might be easy to overlook because of its simplicity, but in reality it will adapt go with anything and will quickly become a wardrobe favourite. This cardigan is great for beginners with some experience. It uses a simple stitch pattern with simple decreases. The body is made in a single piece and the sleeves constructed separately and sewn on. 5mm crochet hook and 1350-1960 aran weight yarn. The pattern is written in 4 sizes S, M, L, 1/2X. Approximate measurements for each size are listed in the pattern to help you choose which size to make. The pattern can be purchased in PDF format from Love Crochet, Etsy or Ravelry. The Free Flow sweater is designed to let you do exactly that! It’s a loose fitting, slouchy sweater which combines comfort and elegance. With 3/4 length kimono sleeves, the sweater can be worn casually dropped off one shoulder, or in a wide boat-neck style. This is a favourite of mine to wear to yoga classes as it keeps me warm before the exercise heats me up and is perfect to throw on during cool down. It even allows me to stop off for a drink after class without feeling like I’m in in full on gym gear! The simple T shaped design uses an easy textured stitch pattern with 4 ply / sport weight yarn to give it that soft drape. This sweater is aimed at those who may never have crocheted a sweater before. It was intentionally designed with an easy stitch repeat and a super simple construction, using two T shaped panels. The loose fit and stretchy nature of the fabric allows room for variation in tension. The pattern uses foundation chains and includes instructions and a video tutorial showing to help those who are less familiar with the technique. Modifications are also given to work into chains. The pattern is written in sizes XS, S, M, L, 1X, 2X, 3X (bust measurements from 96-156cm) and detailed measurements and a schematic are given in the pattern. The pattern can be downloaded in PDF format from Love Crochet, Etsy or Ravelry. The crochet pattern for the Cloud Cover Roll-neck sweater is here just as the blue skies turn white and grey. This light fluffy and cosy roll neck sweater is perfect for keeping you snug on such cloudy days. It’s deceptively warm for its light weight and is oversized to make it super comfy and huggable! The pattern can be downloaded from Love Crochet, Etsy or Ravelry. The Cloud Cover Crochet Sweater has the fluffy look of mohair (thanks to the Brushed Alpaca yarn from Drops), but because it’s worked with Aran yarn, it comes together much more quickly than if working with traditional lace weight mohair yarn. The sweater is worked in simple stitches with a large ribbed roll neck and long cuffs you can roll back or leave long. The perfect transitional sweater for when the clouds cover the sun. This is a simple pattern using half double crochet throughout, working in the back loops for the ribbing. You will create the body pieces flat and the sleeves in the round. This would make a great first garment for the newer crocheter and a simple make for those with more experience. Made using a 5mm hook and Drops Brushed Alpaca silk, the yarn has a lovely fluffy halo which makes it very lightweight but warm. This sweater can also be made in any aran / worsted weight or even a heavier dk yarn which meets the gauge (always check your gauge!). More solid yarns will make a chunkier sweater with a different drape. The sweater is available in sizes XS-3X with suggestions to alter sleeve length. Approximate finished sizes and a schematic are given in the pattern. I hope you enjoy the pattern and, as always don’t forget to tag me in Instagram @doraexplored, or use #hookmehappy. I’d love to see and share your efforts! The Play Time Top is designed to match its name – to play! Play is something we all need to remember to do but easily forget in our frantic lives! This cotton summer vest, made in bright summer colours is a simple and quick make, perfect to whip up last minute for your summer holiday! The tie straps were inspired by my love of dungarees and add an extra element of fun to the top, as well as allowing you to adjust it for the perfect fit! This pattern uses simple stitches to create a bright, wearable summer crochet top. Yarn: Aran Cotton yarn is recommended. Item pictured uses Paris Drops in Light Turquoise and Peach (aff). Measurements of each size are provided in the pattern to help you choose which size best suits. These days are ouuuuuuurs… yours and my happy days… sorry (not sorry), I love that show! The Happy Days cardigan is a fun, practical cropped crochet cardigan, designed with a nod to the nostalgia of the 1950’s hey days. I always struggled with cardigans which stopped at the hip and make me look boxy, so intentionally designed this shape for those who have a waist they want to show off to the world! The pattern uses the extended single crochet (which is described in the pattern) with a simple stitch pattern and has minimal sewing (shoulder seams only!). It’s suitable for beginners with some experience and intermediate crocheters. Yarn: Item pictured uses Hobbycraft In The Zone yarn (aff) but a substitution with a worsted weight / chunky yarn can also be made. The top is loose fitting round the bust and cinched in at the waist. The Maslow’s Rainbow CAL is taking place over on Doralosophy. You can join in at any time and use any yarn weight so it’s great if you have some stash busting to do!! I love simplicity and stripes. My favourite top in the world is a really old white jersey with black stripes. I was wearing it recently and suddenly wondered why I had never tried to recreate it in crochet. So that’s exactly what I did! Life is better when you keep it simple! In honour of it’s name, this pattern uses simple stitches to create an elegant, wearable crochet top. It’s suitable for beginners with some experience (half double crochet, back/front loop half double crochet, decreasing). The top is close fitting with 3/4 length sleeves. For a small fee, you can also purchase an add free printable version of this pattern on Ravelry. This is a great pattern for beginner crocheters as it uses only simple stitches. There is some colour work but it is a straightforward stitch repeat and easy construction, so it’s a perfect project for stitchflixing! This pattern uses US crochet terms, see below for abbreviations. Stitch counts are given in (brackets) at the end of the row. Ch3 is the equivalent of hdc and ch1, unless specified otherwise. Ch2 is the equivalent of sc and ch1, unless specified otherwise . Instructions written between *asterisks* should be repeated as indicated. Unless otherwise indicated stitches should be worked in consecutive stitches. This shrug is worked as a rectangle top down, then folded and seamed to create arm holes. Short sleeves are added to finish. Picture guides for construction are given at the end of the pattern. Foundation Single Crochet – click here for instructions on foundation single crochet, including written instructions and a video tutorial. If you struggle with this technique it can be replaced with making a chain of the number of stitches needed plus 1, then sc in the 2nd chain from the hook and across to the end. Hook: 4.5mmm or as needed to meet gauge. I am using half size up from hook recommended for yarn to create extra drape. It is assumed you will fasten off at the end of each colour change. Lay your rectangle out on the floor. You can block it if you like but the wobbly edges won’t be seen once it’s finished! Fold the square in half with RS facing inwards (below left). Matching the edges row for row, sew up the sides from the open edge up to the start of the second set of stripes (63 rows), leaving openings for the arms between here and the centre fold. Open out into a diamond shape and you will see the arm holes (below). Working on the WS, make 3 rows of sc around the opening of the shrug (this would be the bottom edges of the fold, the first and last row of the rectangle). Join with a ss at the end of each row, ch1and turn to start the next row. Fasten off and sew in ends to form the lapel. Repeat for each arm hole. Turn you shrug the right side out and enjoy! I hope you enjoy this pattern, and as always, don’t forget to tag me in your finished makes! Nothing makes me happier than seeing my designs brought to life by others. I love the colour choices and personal touches you add to the patterns! This post contains affiliate links which means that if you click through to a website from this post and go on to make a purchase I will receive a small commission at no extra cost to you. My full affiliate disclosure is here. We all need more hugs right? That’s what I had in mind when I designed this cardigan. I wanted something cosy and practical that you could wear everyday and feel like you were getting a hug. Plus it has pockets. Everyone definitely needs more pockets!! This cardi is the one you wear so often it never quite makes back from the laundry to the wardrobe before you put it back on! This cardigan is suitable for advanced beginners / intermediate crocheters. Worked top down the Everyday Hugs Cardi is deceptively simple to make. It uses simple stitches and has minimal joining, with the only sewn seam being in the shoulders. The pattern uses around 1400(S/M) – 1800(1X/2X) (600g – 800g) yards of worsted weight / Aran Yarn and a 6mm hook (or hook to meet gauge). The pattern comes in 3 sizes – S/M, M/L and 1X/2X with additional guidance for altering the body and sleeve length so you can easily adjust to get the exact fit for you. Is it a poncho, a kaftan, a tunic or a slanket? It doesn’t really matter because it’s crochet, it’s super cosy, it’s practical and it’s your new lounge wear favourite! This pattern is suitable for a beginner with some experience and uses US Crochet Terminology. This uses the extended double crochet stitch and foundation double half double crochet stitch – both of which are explained within the pattern download. Yarn: 600g / 1650yds (1500m) DK yarn in the main colour (blue) and about 50g / 190yds (175m) of the second colour (grey). I used Women’s Institute Premium Acrylic DK in Blue and Grey for the item pictured. Other: Yarn needle & scissors, 6 buttons of your colour choice. Worked from the bottom, ‘up and over’, this easy make will keep you super cosy through the winter days and summer nights. And the best thing? It has a huge pocket. I am a pocket lover and a poncho lover but you don’t often find the two combined! This post contains affiliate links (my full affiliate disclosure is here). Introducing the Upside-Down Crochet Jumper pattern. I’ve been sucked into Stranger Things just like everyone else. I’ve also been wanting to create a cosy sweater which I simply don’t want to take off all winter. Put those two together and you have the Upside-Down Pullover. This project is suitable for an advanced beginner and would make an ideal first garment project. Using basic stitches (in US terms) there is also a tutorial to help make the cuff and hem which you can see on this post. The pattern includes picture guides to aid with construction and a video tutorial showing how to create the ribbing on the cuffs, hem and neck line. This pattern uses from 850yds (XS/S) to 1300yds (X1/X2) Aran / Heavy worsted / 10ply Yarn and a 6mm hook. The jumper pictured uses just under 5 balls of the Leader of the Pac Yarn (aff) available from Hobbycraft. It’s a beautiful Aplaca blend which is a dream to work with. The pattern is available in sizes XS/S, M, L and X1/X2 all written out separately. The approximate measurements of all the sizes are detailed in the pattern along with gauge information. The stitch pattern in the body is worked one way and in the sleeves is worked the other – but which one is upside-down? The style is lose but not oversized and the shape would fit right into the 80s! Plus it’s completely unisex. A delicate cabled cowl neck crochet poncho pattern, inspired by Alpine Pine Trees, this poncho is practical, wearable but pretty too. Not too chunky, but still warm and cosy, this can be used as the nights get colder, thrown on for the early morning school run or snuggled up on in on the sofa on a lazy Sunday afternoon. This poncho is intermediate level and uses front post double crochet (US crochet terms). Once the increases section of the poncho is completed, the pattern uses a 4 row pattern repeat for the bulk of the length (you can increase the number of repeats to make a longer poncho). The crochet poncho pattern comes in one size but you can change the hook and yarn size to alternate the size. Please contact me with any questions on the pattern! I hope you enjoy making it, and as always, don’t forget to tag me in your finished makes! Nothing makes me happier than seeing my designs brought to life by others. I love the colour choices and personal touches you add to the patterns! Summer isn’t over until it’s over! This quick and easy vest top can be enjoyed from the first days of spring right through to the warm autumn days and paired with a chunky cardi over the winter. Made from worsted weight cotton it’s just right for that seasonal change, keeping you warm as the temperatures start to drop but staying cool when the sun is up! The Free pattern is available on this blog post (in size S only) or the paid printable add free PDF can be downloaded from Etsy, Ravelry, Love Crochet or Craftsy. Beginner / Improver – this is an ideal project for a beginner wanting to make their first garment or a more experienced crocheter wanting a quick and fun project. Descriptions of the Foundation Single Crochet is given in the pattern along with a link to a video tutorial on my youtube channel. Modifications are also offered for those with less experience. In the piece pictured just under 5 Skeins of Lily Original Sugar n Cream (aff) Prints in Denim Blue was used but any similar weight yarn and hook can be used to meet the gage. The free pattern in size Small is available on my blog post is in small and the paid PDF has detailed instructions in S, M, L, X1 and X2 sizes. This can be purchased on on Etsy, Ravelry, Love Crochet or Craftsy. This super comfy crochet sweater makes a great versatile addition to your wardrobe. Pair it with a light vest top in the summer or a long sleeved roll neck jersey top on cooler days. It works up really quickly and would make a great gift! This pattern suits a beginner with some experience. It is ideal for beginners or improvers to try their first garment or is a lovely quick project for those with more experience. It’s loose fit is very forgiving! The pattern does use the foundation double crochet stitch (it also offers a beginner modification if you’re not comfortable with the foundation stitches). You can find a tutorial for the foundation double crochet stitch on my youtube channel along with various other tutorials. The pattern written for sizes S/M, M/L, 1X/2X and 3X with measurements detailed in the PDF. I know. It’s a slightly odd named pattern but if you close-up on the pattern, the crochet cables look a little like towers and because of the flow of the stitch they lean a little to the side which is what inspired the name, that and the lovely slouchy fit. This sweater is super comfy and loose fitting, perfect for those not-quite-summer days where you want to laze around. Equally you can team it with a long sleeved roll neck to add a cosy extra layer once you hit the definitely-not-summer days!